Storr Lochs is home to The Old Man of Storr which has become famous worldwide over recent years and a firm favourite with photographers, the internet is alive with award winning photos of this incredible natural wonder and part of a twenty mile slip that forms the Trotternish ridge. The Storr not only offers a jaw dropping setting for video makers and photographers, it’s become a Hollywood hit too, featuring in Ridley Scott’s Prometheus amongst others. It’s a walkers paradise and the view from the top is incredible, across the Inner Minch to Rasaay, home of Calum’s Road, Rona and the mainland beyond. For those who are a bit more adventurous you can scale to the very top of the ridge and the get the view both ways out over the Minch to Uist, Harris and Lewis of the Outer Hebrides or you could even try cycling up and down on a mountain bike, not for the fainthearted! The Old Man is not the only walk, pick any route out from our apartment and treasure, dinosaurs, deserted villages and caves once inhabited by Bonnie Prince Charlie are all waiting for you. 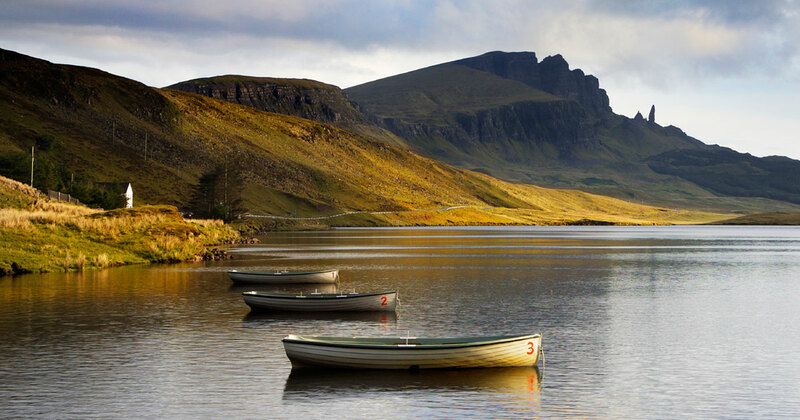 Storr Lochs is stocked with trout and is a draw for fly fisherman worldwide, with boat hire available throughout the fishing season what better way is there to spend a day, even if you don’t fish! The old township of Armishader is a walk across the moor and Bonnie Prince Charlie’s cave is a walk and a scramble directly across the moor from the apartment. It was at Storr Lochs where Bonnie Prince Charlies is said to have stolen a boat from the Loch Fada and took it down to the sea to escape the red coats. Borreraig Bay at the north end of Storr Lochs below steps leading down from the hydro dam offers fossils galore, a 15 ft dinosaur fossil was found here a couple of decades ago and along with other amazing finds along this ridge are now in the museum just a few miles along the road at Ellishader (where you will also find the lovely Ellishader art café). Intriguingly, a chest full of treasure was also found here in the 70’s. The Trotternish Peninsula is becoming a hotspot for fossil finds and a haven for dinosaur hunters! You can find the most amazing dinosaur footprints on Staffin Beach dating back to the Jurassic period 165 million years.